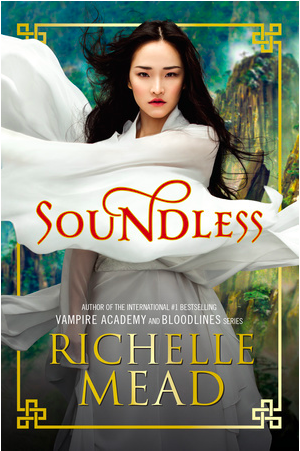 Back in September, I did a write-up of the first three chapters of Soundless, so I'm going to go ahead and link it here, as it contains a summary and my initial thoughts on the setting and world-building. For the people who thought this book wasn't "Chinese" enough - what else were you expecting? Is Mead supposed to drop "won ton soup" and "kung fu" into every other sentence? The characters are Chinese, their names are Chinese, Mead draws from Chinese folklore (and I appreciated that in her acknowledgments, she mentioned that she consulted with people who knew more than she did in order to write this book), she tells us that they are Chinese, so what else is she supposed to do? Fei and her fellow villagers experience love, suffering, desperation, and fear - just like other human beings. Are love, suffering, desperation, and fear all white by default? Do Chinese people (or black people, or Latino people, or any other people) not also experience those things? Again, what would've made the story "more Chinese," especially since it's very easy to cross that line into relying on tired old stereotypes and making it sound like you're working off an ethnicity checklist - Let's see, I haven't yet mentioned rice, honoring your ancestors, and slanted, almond-shaped eyes. I need to work those in somewhere. Um, nope. As an Asian-American reader reading a white author writing about an Asian culture, I felt like it was enough. Maybe other AAPI readers will disagree, but I respect Mead for not crossing that line. She gave us names, she gave us setting, and my imagination was enough to fill in the rest. That said, this wasn't the most powerful thing I've read from her. The other books I've read from her were better, and she could've taken more time with the world-building, but by the end a lot of questions were answered. I would've liked more for the ending - I felt like it was a little abrupt, and just when I was really getting into things, it was time for the epilogue. There was a tease of a love triangle, but thank god it really didn't turn into that. It's not really a spoiler for me to tell you that there is really no drama there at all. Yeah, this novel really could've benefited from more, I think. Not in a "GIMME MOARRRR" sort of way, but in a "Take your time, I'm listening" sort of way. That said, I still enjoyed it. It wasn't the best thing I've ever read from Richelle Mead, but I liked it well enough.